The Pound couldn’t hold on to yesterday’s gains as mounting concerns about the future of Brexit left traders confused. UK PM May's spokesman said that PM May would write to EU's Tusk to ask for an extension of the departure date before the summit, after EU officials said that it is unlikely that Brexit will be finalized in the upcoming days. Later in the day, EU's Chief Negotiator Barnier reiterated that if the UK wants an orderly Brexit, the current deal is 'the only deal,' adding that they are now facing 'genuine uncertainty' about Brexit. In economic news, the UK released an upbeat unemployment numbers as the rate fell to 3.9%, better than the 4.0% anticipated, while wages rose more than anticipated, up by 3.4% in January. The Claimant Count Change for February was the only disappointing line, up to 27K vs 13.1K. Today, the UK will release February inflation figures, which could have a limited effect on the GBP, as the main focus remains on Brexit headlines. 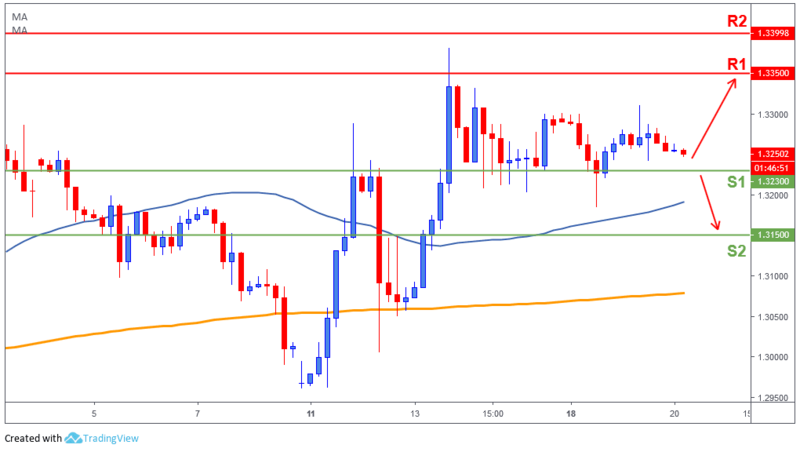 The Pound peaked at 1.3310 and settled in the 1.3260/70 price zone at the end of the day, as price is still trading between 1.3230 (S1) and 1.3350 (R1) with no directional bias as of yet. The market is waiting for a significant Brexit catalyst to break above or below those two levels.